Encouraging a small child to love the journey of learning can be a super-fun task. 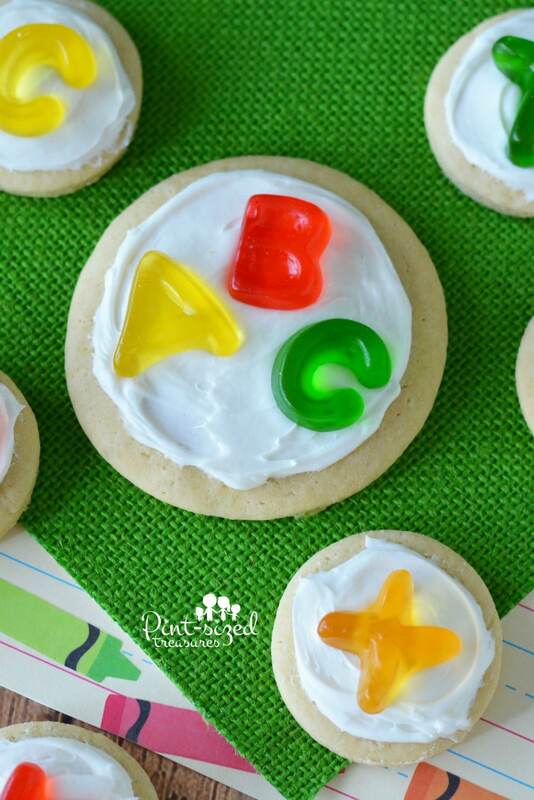 These easy alphabet sugar cookies always make my little learners smile! And since I live busy mom life like you, I need something simple that won’t make a huge mess and soak up several precious hours. That’s where this simple sugar cookie recipe comes in! How many fond memories do you have of baking with an aunt, mom, dad or grandparent? Pass those sweet experiences down to your kids! I treasure the times I get to spend with my kiddos in the kitchen! They have learned to make so many recipes by just cooking alongside their mom. They not only have learned an important life skill, but have also created long-lasting memories they can tuck away in their hearts. They’re tucked away in my heart too! <3 When making these cookies, let me share a little secret with you. Don’t ignore the softened butter description in the ingredients list! You need very softened butter, like complete butter mush for these cookie to turn out oh-so-perfectly. Trust me on this one! Plus, this recipe will cut your sugar cookie baking time in half because you don’t have to store it in the fridge for two hours before baking! Woot! Now, all cookie bakers know that cookie dough is easier to work with if it’s been refrigerated for at least 30 minutes, however it’s not exactly necessary for this specific recipe. I try to keep things super simple! Oh, and you can grab those right here. Here’s a few learning tips to make these cookies extra fun! Group all green letters together to focus on colors. Spell three letter words on each cookie. Do one entire word family with a dozen of the cookies. For instance, you can spell mat, hat, sat, cat, fat, etc. on one batch. Let your child think of simple word that describe learning or school. Spell those words out on the cookies. Choose one batch of cookies to be “vowel” cookies. The other cookies can be the “consonant” cookies. Briefly discus the differences. If your child is in first grade or older, you can have her use the cookies to spell her spelling words. She can spell them on two if needed! 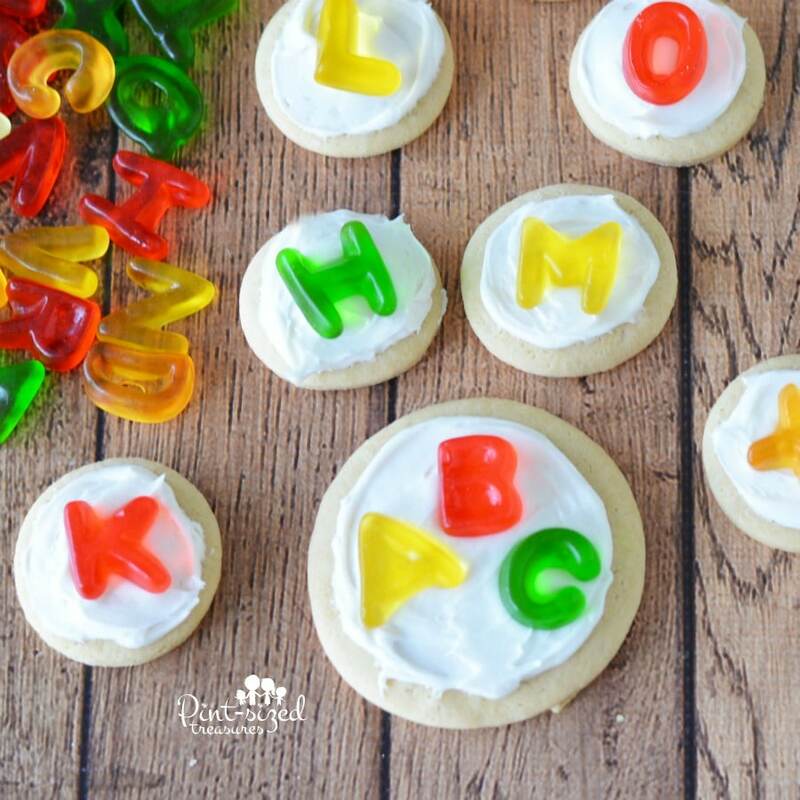 What fun ideas do you have to use with these alphabet cookies? I’d love to hear them! *Affiliate links have been added to help you create these adorable sugar cookies! Super-cute cookies that are great for learning! They're simple to make and require no refrigeration time before baking. 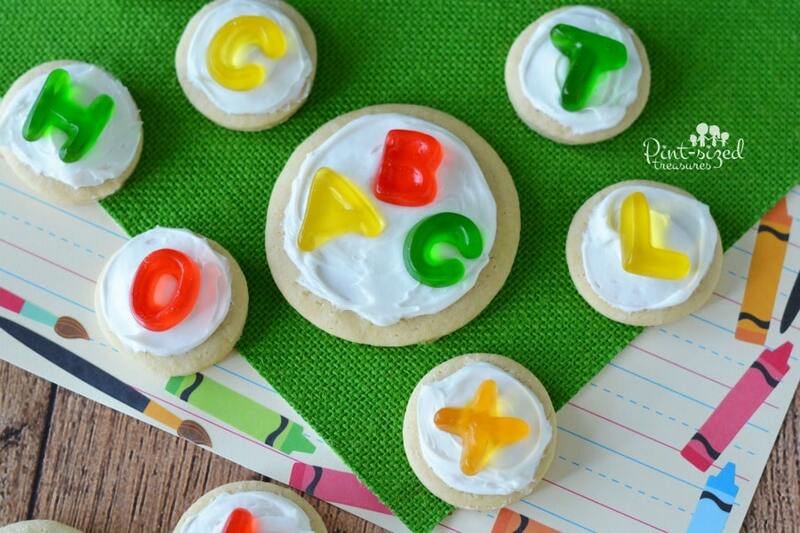 Enjoy the learning ideas that make these easy alphabet sugar cookies a hit with your little learners! Line several cookie sheets with parchment paper. Gradually blend in the dry ingredients --- 1/4 cup at a time. Roll rounded teaspoonfuls of dough into balls, and place onto parchment lined cookie sheets. Bake 8 minutes for super-soft cookies or 10 minutes for crispier cookie. Let cookies cool for five minutes before removing to wire rack or plates for cooling. Add gummies to top of cookies for decoration.